I’m a college student, so easy-to-prepare, easy-to-eat meals are extremely helpful. Some form of veggie patty or burger that I can freeze and then cook when needed is definitely preferable, and although my favorite recipe is my anarchy burger, avocados aren’t exactly in season so I needed to try something new. I’m fairly picky about my burgers (the VCon Black Bean one doesn’t do it for me–too gluteny–for example), but after an extensive search during some down time at work I decided to try the Sweet Potato and Black Bean burger from vegan-food.net. My love of sweet potato fries is unequaled and black beans do make delicious burgers, and quinoa is the most delightful grain, so how could this go wrong? After a few substitutions due to what I had on hand, I shaped up 20 patties, froze most of them, and cooked a batch on my spankin-new George Forman grill. The grill now holds the place of one of the most useful Christmas gifts from this year. The salad in the background features fresh greens from Vegetable Husband and the Tahini Salad Dressing I made a few weeks ago. With fresh croutons from the Dekalb Farmer’s Market, Vegan Dad’s homemade hamburger buns, sweet potato/black bean burger, it certainly was a tasty, complete meal–and all in under 10 minutes! Heat oil in a skillet over medium heat. Add onions and garlic and lower heat. Cook until lightly browned, several minutes. Add carrots and beans and cook an additional 4-5 minutes, stirring occasionally. Turn off heat. Mash slightly in pan, until beans are half crushed. Place skillet mixture in large bowl with remaining ingredients and mix thoroughly. If mixture is too moist, add more breadcrumbs. Form into 15-20 patties. Cook what you need on a George Forman Grill, in a skillet with a little oil, or in the oven at 350 degrees. Wrap the rest in saran wrap and freeze until needed! that sounds AMAZING. i love sweet potatoes and black beans! Oh yes, easy-to-prepare, easy-to-eat meals are always good. Fantastic looking burger! easy & awesome?!? i’m in! the vcon burgers are also too gluteny for me. i can’t handle a lot of vital wheat gluten, i use it in whole wheat bread & pizza crust – that’s about it. i’m also quite picky about my bean burgers – i say, nothin’ wrong with that! 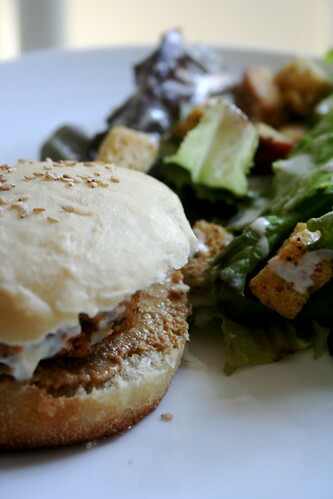 nice job on the homemade buns, too – they make the meal so much more glorious! this burger sounds delicious! we can get quinoa in bulk and i’ve been looking for a tasty recipe to pick some up for. i think this is gonna be it! mmmmmmmm! now all i need to do is grab some caraway seeds and i’m in! thanks for another rock’n recipe, Jes! I never tried sweet potato in a burger before, but it sounds really good. I am going to try this. Thanks for the recipe. Yum! This looks like a great recipe! Burgers are so perfect! I’ll have to try this – thanks for the recipe! wow, great combo! the options for veggie burgers are endless…. These look amazing! What a great idea to use sweet potato with black beans. Sounds delicious! I haven’t made a burger in ages, but this sounds delectable! That’s awesome! Especially if they can be frozen. You do realize I’m not only stalking you and reading all your old Cupcake Punk entries (Anarchy Burgers!?!? Oh, yes!!!) but am planning whole meals based solely on your blog posts? And now I obviously NEED a George Foreman grill. Obviously. Thanks for this — haven’t really ventured back into burger-world, because I think I’d previously relied on cheese to sort of “glue” my vegeburgers together… since choosing veganism, I’ve tried a chickpea burger recipe TWICE — that hasn’t worked yet. This looks doable. I am encouraged. Oh Wow this looks delicious! And so easy – thanks so much for sharing. Oh how I wish I could make these for lunch!! I have everything else to make these burgers except for the elusive sweet potato! Grocery shopping day isn’t until Thursday! Patience. Must. Practice. Patience. these sound wonderful! i haven’t had a decent veggie burger in a long time… i’ll have to make this one! MMMMM… Well now I”m hungry! these look so good! What is the difference with using red quinoa? I have never seen it at the store, should I seek it out? Mmm, I’ve gotta try this out- But with chickpeas! I can’t get enough of those little beans. I just bought sweet potatoes, too! perfect timing, Jes. This looks delicious..I love the addition of quinoa into the burger – must try! And I totally agree on the V’con burger..why add the extra gluten? Made these last night – LOVED the flavor, though the bf found them a bit too heavy on the caraway. I used chili powder and a little tomato puree instead of adobo – worked like a charm. They were a bit mushy so I think I’ll up the breadcrumbs next time and maybe let the quinoa really dry out before I use it. But there definitely will be a next time. Btw, I also found that cooking them in the oven for a good long while on 350 helped firm them up quite a bit!